I’ve mentioned before the importance of team design and culture, so let’s dig into this intensely complex question: What are the makings of a PERFECT co-founding team? Ultimately, the things that are most important to team success are the ones that take the most effort to uncover. It’s hard to uncover the perfect mix of right things in potential teammates – finding teammates with similar interests seems hard enough. But herein lies the problem – the focus in what you are trying to uncover in teammates. Many entrepreneurs start with finding others who have similar business or industry interests, since this tends to be easiest to assess and who they tend to already know. Unfortunately, many of these teams have issues later in the process, having different motivations for working in that industry. The key is to start by finding people with similar goals, then ensure you have complementary skills to be able to trust one another in your unique areas. 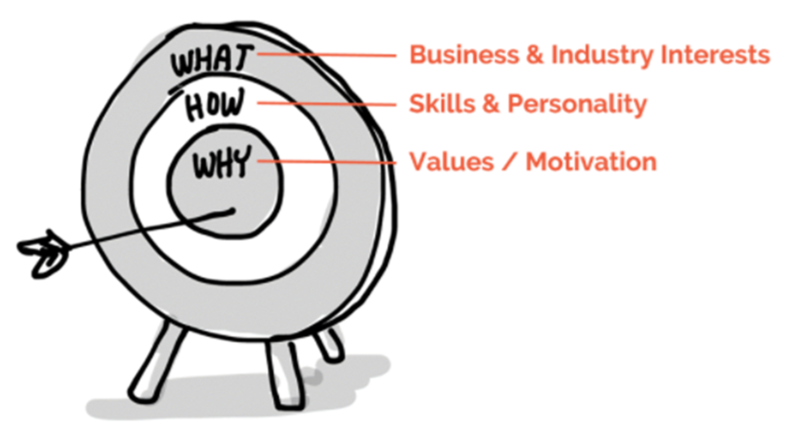 In the context of finding co-founders, the “why” is someone’s values or motivations for starting a company. The best co-founding teams have similar drives for starting something, and this plays out in their decisions throughout the company – the types of customers they choose to target, the way they solve the needs of those customers, how they extract value from what they’ve created, their growth plans, etc. Some examples of these types of motivating factors might be to serve and make an impact, being driven by entrepreneurial creativity and innovation, loving a challenge, wanting to be an expert, reward, stability, or many others.Motivational compatibility does not guarantee success, but incompatibility is asking for trouble. If one person is driven by creating some innovative and cool, and another person is driven by the social impact, and yet another is driven financially, there will be challenging decision making down the line for the company. You want there to be constructive debate within the company, but not on the fundamental values – this is where you should have alignment. Next, “how” is also sometimes known as the strategy you will use to achieve your “why.” In the context of your team, this is your mix of skills, and in the ideal founding team, these are complementary skills so that you can each of distinct roles that will not be overlapping, so that you can each trust one another and have full accountability within your domain. Depending on the type of company being formed, an early stage startup should typically have three types: the hacker, hustler, and designer. The hacker is essentially the product developer, the designer is the marketer, brander, and visual design person, and the hustler is the sales and business person. All three people play a lot of cross functional roles and may shift across the boundaries as the startup evolves, though having this in mind as a starting point can be helpful. The mistake many first time entrepreneurs make is forming a company of people just like them – all hustlers, or all hackers – since this is who they know or who has similar interests. When there is too much overlap in skills and ideas, some of the people just end up being implementers and this can become frustrating and disengaging, which can be challenging for the morale of the startup overall. The proper team setup is important to avoid this. I also suggest researching complementary personality types, where some aspects of MBTI can be valuable, plus for MIT Launch we use OCEAN (openness, conscientiousness, extraversion, agreeableness, and neuroticism), to better understand potential team dynamics. The key here with personality comes down to setting expectations and ensuring open communication. I also suggest having a look at the five dysfunctions of a team and potential ways to avoid these. Although many aspiring entrepreneurs are tempted to start a company with a best friend or family member, these are actually the least stable. They tend to have a 6-month honeymoon period, but some difficult discussions tend to be avoided, which can end in disaster. Data by Noam Wasserman of over 10,000 startups shows that companies with co-founders of this type have much lower stability over time. Everyone wants to believe they’re different, and point to exceptions, but these statistics exist for a reason. Understand them and choose your battles – you’ll be fighting enough of them as an entrepreneur! Good luck in your hunt for the perfect team. Thank you! I love the advice, will apply it. The description is insightful and what I like most about it is the fact that it lays out the blunt truth and doesn’t paint a rosy picture of situations. Great advice. Perfect! I speak spanish but this read was really easy to understand, it’s clear and interesting. The themes are realy important to know for people who wants to start a business idea. Thanks for a great article that gave me a better understanding of choosing the right team members. There are also three pictures missing in the content and from the context I think they probably are helpful illustrations to better explain. i found it to be most precious advice to select the co-founder for the business.